The Ujung Kulon National Park Authority (Balai Taman Nasional Ujung Kulon) discovered three new Java rhinos throughout March to August 2015 by a hidden video cameras. The findings were very rare. In fact, a number of field surveys have never met a physical encounter, just a trace. "The birth of these calves shows the rhino population in Ujung Kulon National Park (Taman Nasional Ujung Kulon) still gives hope for the survival of endangered species," said Moh. Haryono, Head of Ujung Kulon National Park Authority on Monday, September 7, 2015 in Jakarta. 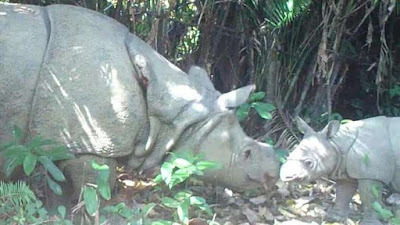 The first rhino calf (female) recorded by hidden video camera for the first time on April 9, 2015 at 17:29 in Citengah Block (east Ujung Kulon). The calf with her mother named Desy which known in 2012 have a male calf named Arjuna. Throughout 2014, Desy recorded always alone. The last recorded on August 13, 2014 at 19:22 in Cigenter Block encountered in conditions of allegedly big belly is pregnant. The second calf (male) was first recorded on May 25, 2015 at 18:24 in Cijengkol Block/foot of Mount Kendeng (west of Ujung Kulon). His mother named Siti. In 2011, Siti also have a male calf named Dwipa. Throughout 2014, Siti always alone and the last recorded recorded December 3, 2014 at 06:13 in Hulu Cidatahan Block, about 3 kilometers from the Cijengkol Block in conditions of allegedly big belly is pregnant. The third calf (male) was first recorded July 8, 2015 at 13:16 in Rorah Daon Block/Cikeusik (south of Ujung Kulon), with the mother named Ratu. Throughout 2014, Ratu last recorded by September 13, 2014 at 03:48 in Citadahan Block in pregnant condition. Through these findings of three Javan Rhino (Rhinoceros sondaicus) calves, then the population of endangered species in Ujung Kulon National Park increased to 60. Previously, based on monitoring by 2014, the number of Javan rhinos in Ujung Kulon National Park totaled 57, includes 31 males and 26 females. There are two issues related to the future of the Javan rhino, the larger ratio of males and vulnerable natural habitats affected by the eruption of Krakatoa Mountain and minimal supply of feed.